These days, the popularity of swim spa is so crazy. There are so many homeowners who are willing to spend lots of bucks to purchase one and make it as the main attraction of their house. Ita��s so understandable that a swim spa can provide a superbly fun experience, and of course improve the health of your well-being. Imagine if you have one in your backyard, you can enjoy such exhilarating moment every single day. For some, swim spa can be an expensive home addition to buy. However, with so many various options available in the market, you can always choose the one that suits your budget and need. 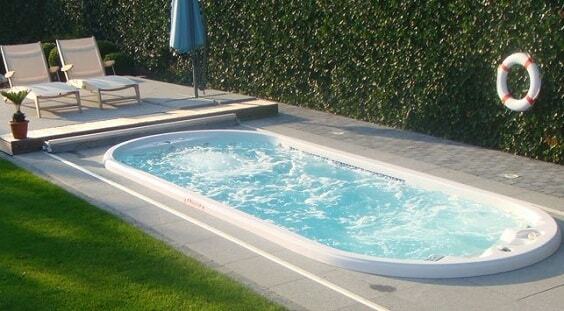 In fact, a swim spa can be a cheaper solution than building a real pool. You can save lots of your budget if you go with a swim spa rather than a swimming pool. Then, the pricea��s difference between a regular hot tub and a swim spa is actually not too far. 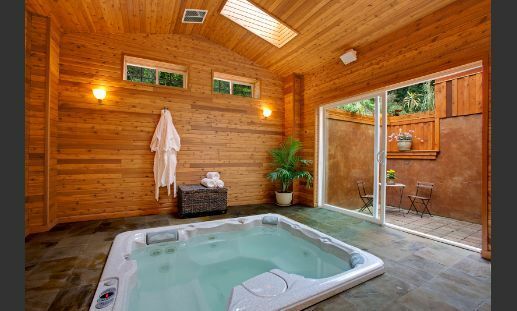 By just adding some bucks, you can have a swim spa which has much better features than a hot tub. So, investing your money to purchase a swim spa is always a great idea. 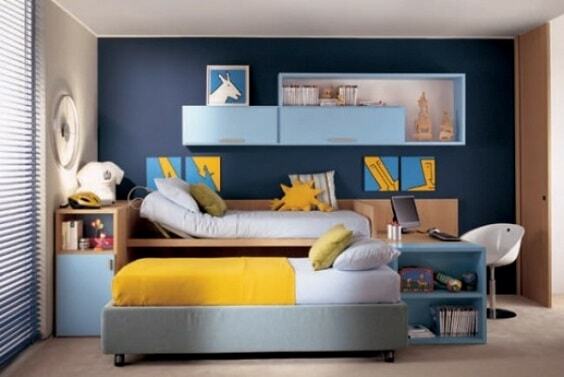 You can have a very sophisticated home attraction that everyone can enjoy. Well, if you have a plan to add a swim spa to your outdoor living space, here we have some inspiring swim spa installation ideas which will stun you. Ita��s such an essential thing for you to find out these kinds of ideas before you install a swim spa in your beloved home. 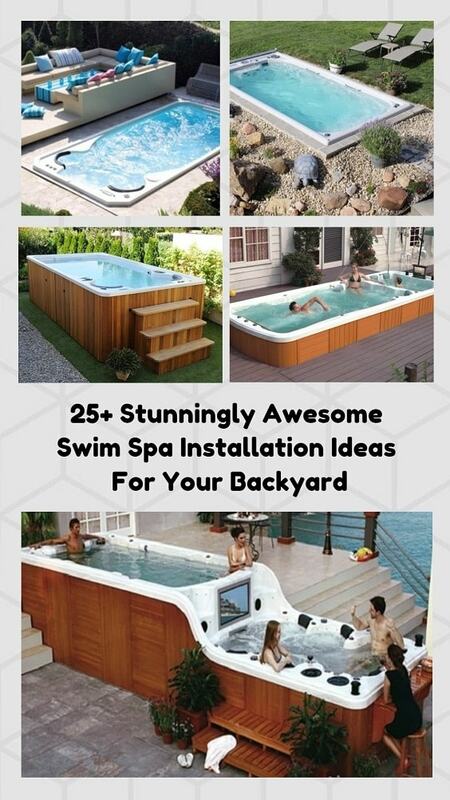 An amazing swim spa installation ideas which is so tempting to have. 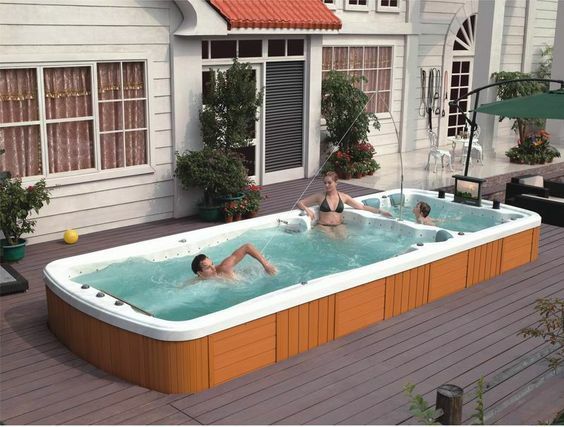 Ita��s designed in a double-decker style with a 7-person hot tub on the lower part and a swim spa on its top. To make this swim spa feels more exhilarating to enjoy, an LED screen with sound system is added. Such a superbly inspiring idea that you have to try. The cover is made of wood in a natural redwood finish with the greeneries around. It also has the built-in bar table with the chilling bench. 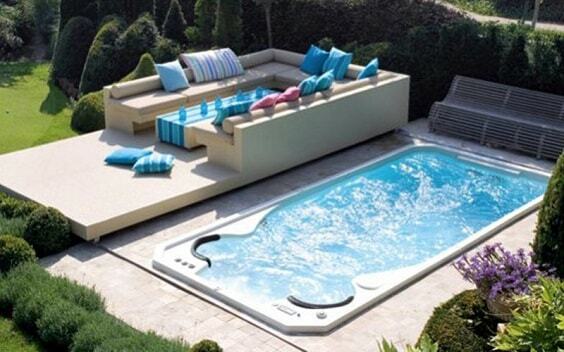 Installing a swim spa close to the spot where you relax your body in your backyard is surely a great idea. 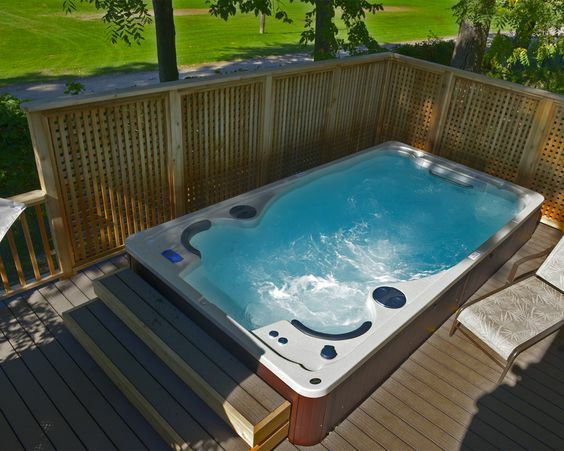 This one shows an oval swim spa which is built right in front of the deck. 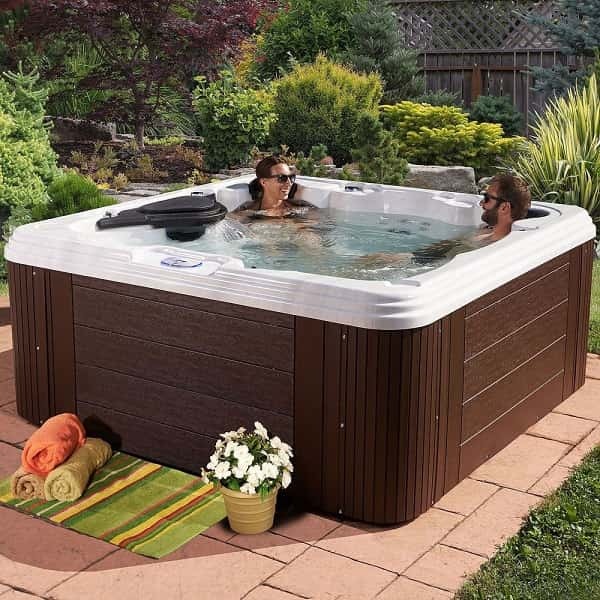 The depth of the swim spa making it installed a bit higher than the deck, so a step is added to provide a better convenience in using it. 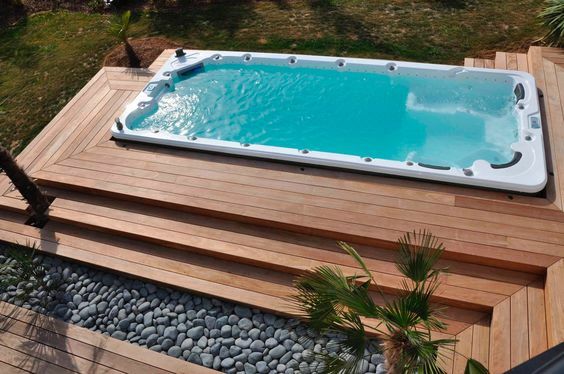 Still, the wood plank is chosen to cover the body of this swim spa which looks gorgeously beautiful. 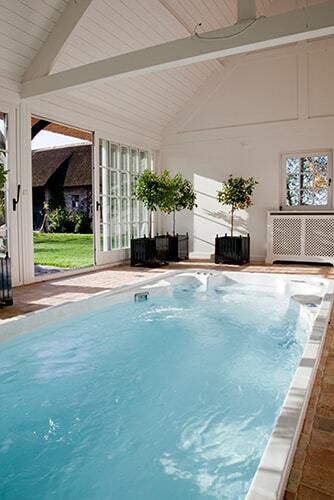 A stunning swim spa installation ideas which look gorgeously decorative with lots of accents. Ita��s installed on the deck, shaded by the pergola and completed by the raised beds with flowers. It makes the swim spa becomes a catchy focal point to make your backyard look as jaw-dropping as possible. Installing a swim spa in an above ground construction is a better idea than the in-ground one. It looks more awesome and saves lots of budgets too. Here, the swim spa is surrounded by the gorgeous earthy rock in natural beige. Then, the wood accent which slightly like a mini pergola gives another style and provides better privacy. The beautiful swim spa installation ideas with the classic theme to add another style to your outdoor living space. It has a gorgeous concrete frame with the brick top which will flow beautifully with the backyarda��s surrounding. The chilling spot is made of wood with a natural finish which also works as the space to display some decor items. 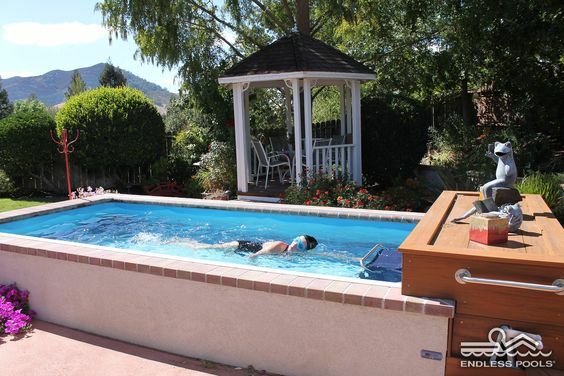 If you are looking for an attractively decorative swim spa installation ideas, this is one of the best inspirations. 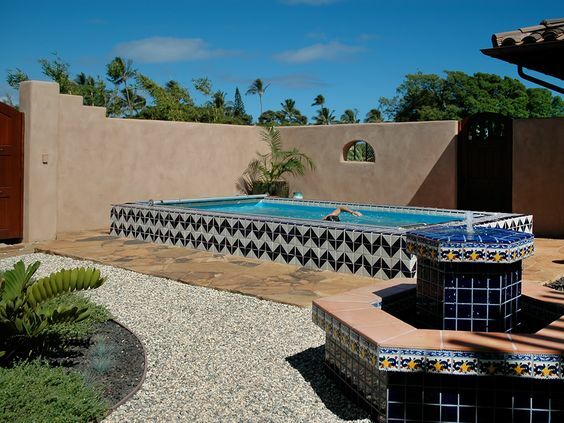 The swim spa is surrounded by Chevron tiles in BW finish which makes it look festive yet still minimalist. It gives this outdoor space a superbly catchy touch which enhances its beauty perfectly. 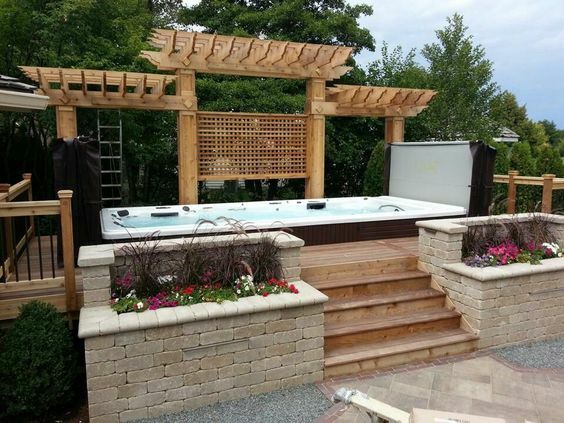 A mesmerizing swim spa installation ideas with a rocky frame which will flow beautifully with the backyarda��s overall look. The finish of the rock is natural grey to keep the earthy nuance of the yard. The swim spa is also placed on top of the base with huge rocks in random shape which is so awesome. 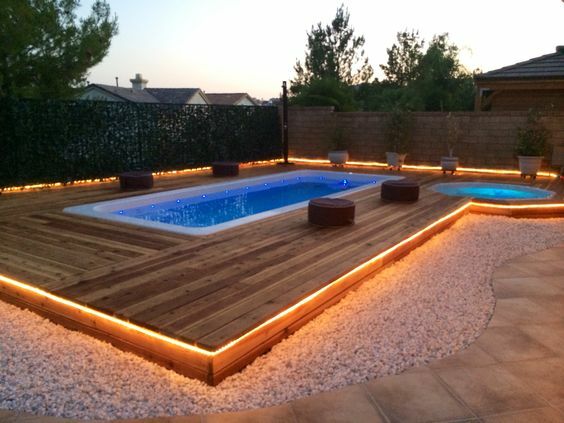 This swim spa installation ideas combines wood and concrete to decorate its surrounding. The frame is made of wood planks which are placed vertically with the earthy gray concrete top. 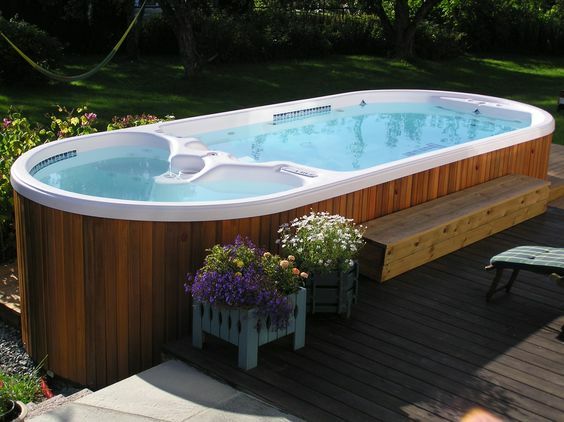 The swim spa itself is installed in semi in-ground design which is great for a small outdoor living space. 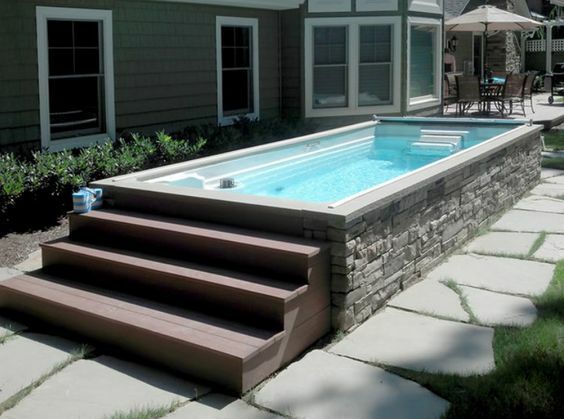 You can benefit the height of a swim spa to create a raised deck just like this idea shows. The deck is made in line with the height of the swim spa which is inspiring to try. To make it look more attractive, the rocks and greeneries decorate this backyarda��s entertaining area. 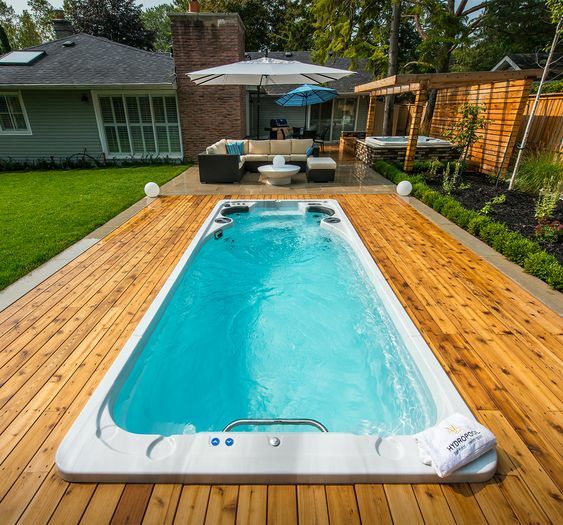 Here, the swim spa with a faux wood frame is installed in semi in-ground way on the center a deck with a natural grey finish. It creates such an inviting look to make your outdoor space feels so exhilarating. It can be included in your simple swim spa ideas inspiration list. A swim spa will surely enhance the entertaining nuance of a patio, so installing it around the area is always a great thought. 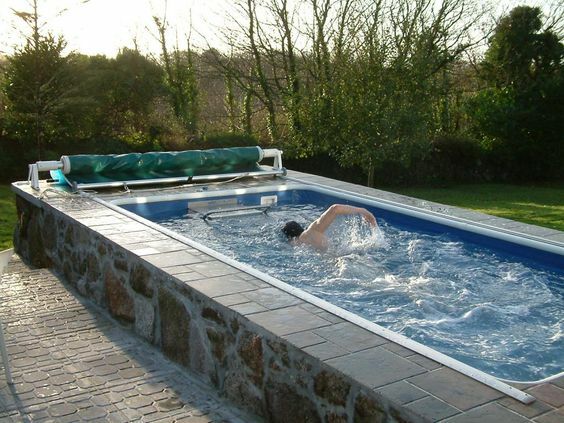 This one shows a swim spa which is installed in the patio area in a fully in-ground way. The leveled seating area next to the swim spa make this backyard looks and feels so inviting. Making a swim spa as the main focal point of your outdoor living space is surely a great idea to do. 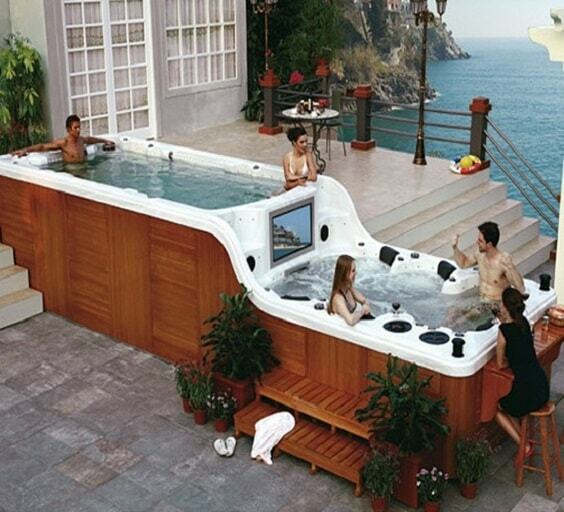 This swim spa installation idea is one of the great inspirations to make your swim spa looks catchy. The swim spa is surrounded by the rocky garden which brings its overall look to a whole new level. It makes the pool become the central attention of this backyard. An inspiring swim spa installation ideas which looks so mesmerizing with its design. This is the in-ground swim spa which is built on the long rectangular patio which suits very well for you who love something minimalist. The patio area beautifully styles up the green backyard and make it look stunningly modern. 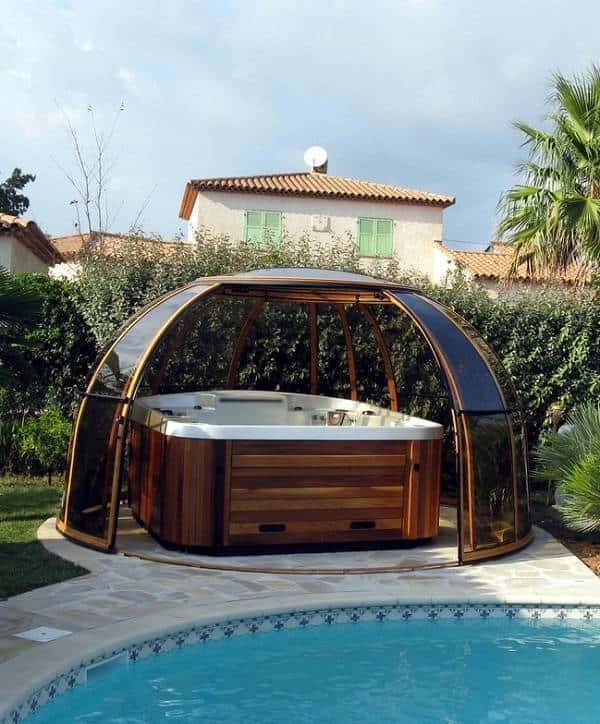 Shading your swim spa doesna��t only provide a better comfort to enjoy it, but also make it look way more attractive. Here, the pergola-styled shade is used to shade the swim spa stunningly. With such shading design, you can still enjoy the swim spa when the sun streams in the middle of the day. The beautiful swim spa which will enhance the beauty of your outdoor living space with its rustic look. Ita��s surrounded by the wood planks which works as a chilling spot in a rustic finish with its natural grain. Then, the seating area is placed close to the pool to provide an exhilarating spot to enjoy. The sophisticated swim spa installation ideas which will make your backyard looks stunningly amazing day and night. Here, the string lights are attached to the edge of the deck to make it look way more attractive. Some small round chairs are placed on top of the deck to provide nice seating area to enjoy. 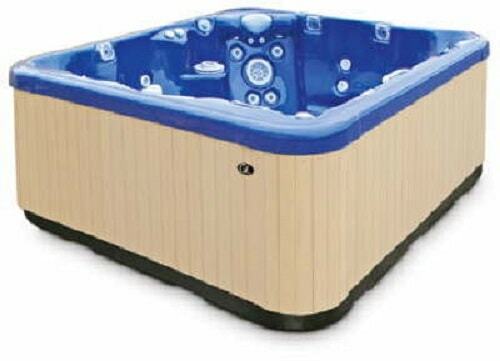 A complete swim spa installation ideas which will provide the maximum enjoyment in your outdoor living space. 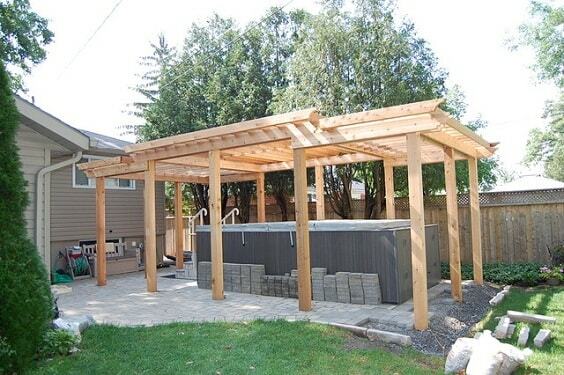 Ita��s built with the deck, pergola shade, and fence, so you can have a super fun pool party with dozens of guests. 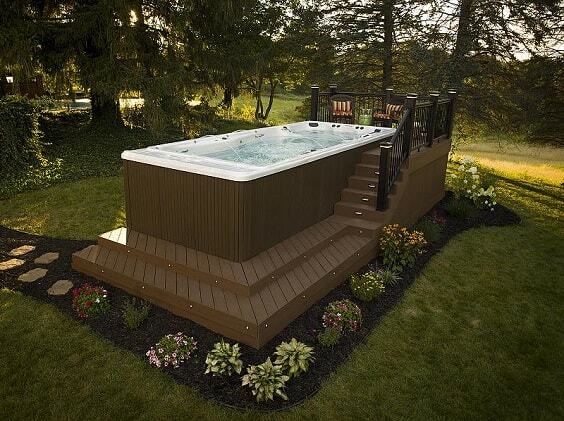 The deck is built in a level style which is in line with the height of the swim spa. 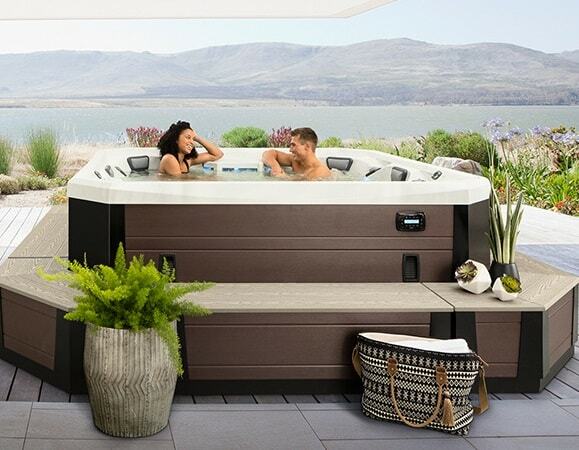 For you who want to feel the spa experience every single day in your backyard, this swim spa installation ideas can be your best inspiration. 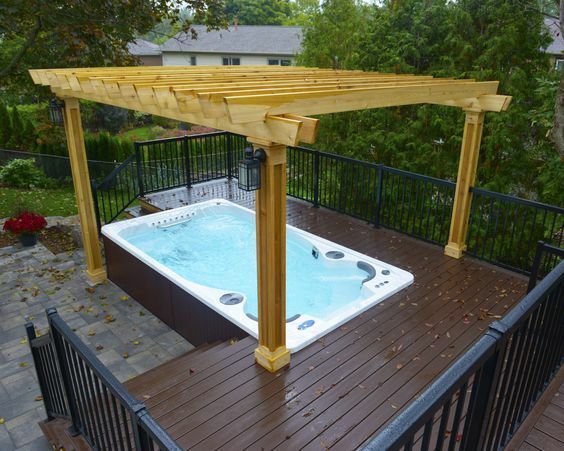 The swim spa is installed in a semi inground style on the deck and surrounded by the wooden fence in a lattice design. It surely brings the a�?real spaa�� atmosphere which also refreshes the nuance of the outdoor living space. Natural theme is always the best one when it comes to swim spa landscaping since it flows well with the outdoor surrounding. This inspiring swim spa installation ideas is one of the superb references which is so tempting to copy with its landscape. Ita��s built on the red deck in a washed white finish accompanied by the greeneries around which looks so admirable. Then, the wood fence in classic design works as the border of the pool area. Another beautiful swim spa installation ideas with rocky landscape for you who love a neutral-colored focal point for your backyard. The swim spa is installed in the center of the concrete frame with rocks accent. Then, the grey tiles cover the top of the frame to create a more modern look. 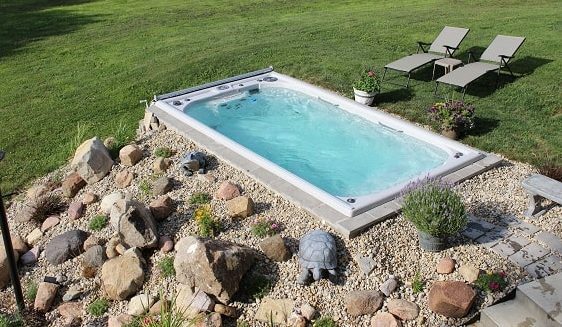 Yeap, the standalone option is the easiest and simplest swim spa installation ideas that you can choose. It doesna��t involve extra materials or extra works which surely will save your budget too. 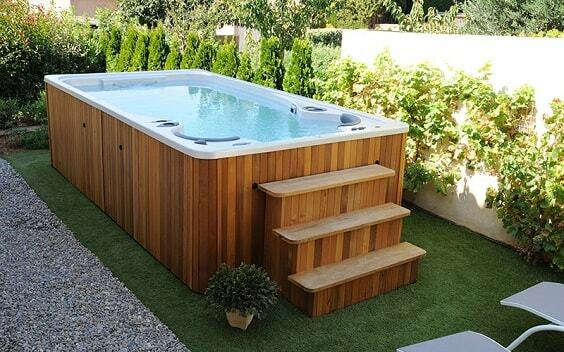 This swim spa with the faux wood frame is installed on the grass field with the greeneries around. The grass field is particularly made for the swim spa area to make it as the focal point of the yard. If you think that installing a swim spa in an outdoor space doesna��t suit your needs, then choosing the indoor area is never a bad idea. The thing is you have to make it as joyful as possible as the attraction site of your property. In this swim spa installation ideas, the sunroom with lots of windows is used as the swim spa area. It lets the sunlight to come through to the room which makes it so refreshing to enjoy. 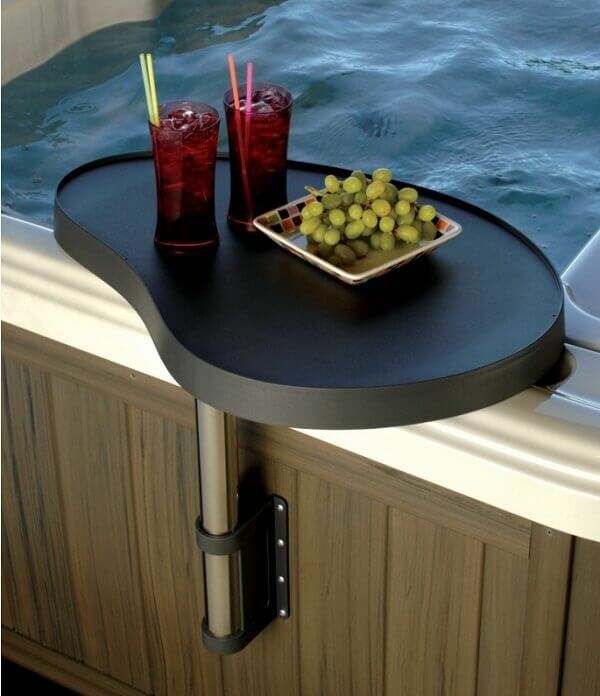 The beautiful swim spa installation ideas with the raised base for you who love something much simpler. Ita��s placed on the top of the black sand base which makes it look so elegant. Then, the flowers around the sand naturally colorize its landscape and give a more inviting touch. Eventually, those are some superbly mesmerizing swim spa installation ideas that you can use as an ultimate reference when you are about to install one. They look totally attractive to enhance the overall look of your outdoor space. 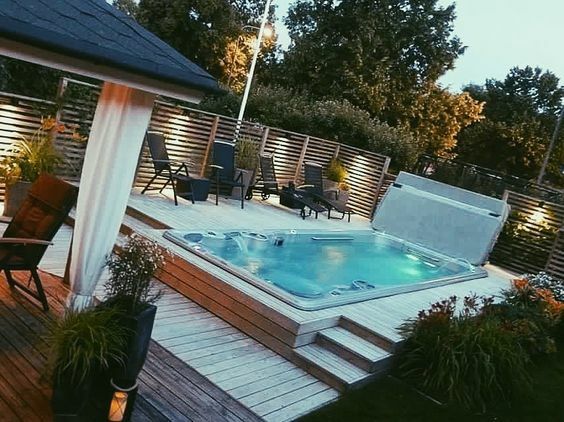 With those ideas, you will have a swim spa which doesna��t only provide endless benefits for your health, but also the one which brings the style of your house to a whole new level. You cana��t just let your swim spa is installed without any decoration which can make it look way more awesome. Choose the one which matches the overall look of your outdoor space to get a beautiful harmonious look in your exterior layout. Make sure, that the decor flows well with the surrounding of your outdoor living space. So now, there is doubt about installing a swim spa or not since it will offer you lots of good things. Ita��s time for you to decide which swim spa model that suits your need and the decor that will beautify its look. Happy remodeling your backyard, then!